The 2019 Range Rover Evoque has a great deal riding on it. It replaces a car that almost singlehandedly underpinned some very good years for Jaguar Land Rover since its launch in 2011. The Evoque proved that the Range Rover brand oozes premium appeal even on a smaller car, can earn super profits on more modest vehicles, and pretty much every Land Rover that followed it owes something to the car’s strong visual DNA. But times are changing fast, and the wheels have come off JLR’s continued profitability and success – sales are waning, the company’s been caught on the hop over the dash from diesel, and the new Evoque can’t come a moment too soon. But the good news for Evoque fans is that the all-new Mk2 car is reassuringly familiar. But why would they mess with the winning formula? With 217 awards and more than 750,000 global sales, the Julian Thomson-styled original still looks progressive and edgy all these years after it first went on sale. That’s why the new Evoque’s styling both inside and out are evolutionary rather than revolutionary, but under the skin, it’s bristling with cutting-edge tech, with an emphasis on driver aids and drivetrain efficiency. What new tech is in the 2019 Range Rover Evoque? The big news is that the 2019 Evoque sits on JLR’s all-new Premium Transverse Architecture platform, which is capable of accommodating internal combustion engines (ICE), plug-in hybrids (PHEV) and full electric vehicle (EV) drivetrains. At launch, the engine line-up is ICE-only, although all but the entry-level manual version feature a new 48-volt mild hybrid system. The Evoque’s mild hybrid system is similar to those used by Mercedes-Benz and Audi to recover braking energy, which is stored in a battery to use for low-speed driving and to boost performance when accelerating. They are all are powered – for now – by Ingenium petrol and diesel engines. At launch, 2.0-litre engines of both varieties will be available, all with automatic transmissions, barring the entry-level front-wheel drive 148bhp diesel which has a manual gearbox. If you want a PHEV, you’ll have to wait until later in 2019, when the three-cylinder powered plug-in hybrid is rolled out. The Evoque’s bodyshell might look familiar, but it has 13% more torsional rigidity than the outgoing car, which brings huge benefits when it comes to tuning out NVH issues, as well as improving handling and ride. The other good news is that although the body-in-white is similarly sized, thanks to its longer wheelbase there is more room in the rear for passengers and luggage – a consistent criticism of the old Evoque. It’s also been simplified – so, no more three-door Coupe or two-door convertible. To this stiffer body, and via new high-strength suspension towers, the new Evoque employs a heavily revised strut front suspension (with hollow cast-aluminium knuckles and a type of vibration-killing hydro-elastic bushes normally reserved for Range Rovers) and Velar-derived integral-link rear suspension. There’s increased use of aluminium, cutting weight and unsprung mass. The front lower control arms are aluminium, as is the subframe. At each corner aluminium hubs mount steel outers via locking rings, while the anti-roll bars are hollow, further saving weight. On the adaptive dampers, the accelerometers have been moved from the body to the hubs, so they can more quickly and accurately detect movement. The new steering system employs a more symmetrical twin-pinion set-up, increasing feel and accuracy while cutting weight. Torque vectoring is by brake on standard cars, but with the active driveline the Evoque gets a little sharper. Now the outside rear wheel can be fed additional torque to quell understeer, while active management of the power your greedy right foot’s unleashed can be used to help neutralise oversteer. We’ll see if it all works in this Range Rover Evoque review. So how refined is the new Range Rover Evoque? So far, we’ve driven two versions of the Evoque ­­– the D240 (237bhp diesel) and the P250 (248bhp petrol), which are positioned towards the top of the range. And the good news is that in both cases, they are a step change over what came before in terms of refinement. Starting with the D240, this is a bit of a revelation, as although the diesel Ingenium is an effective power unit in raw numbers, up to this point it’s been a distance away from the head of the pack elsewhere. But JLR has been honing its installation, and following on from the advances in this area made by the E-Pace, the 2019 Evoque’s a very peaceful place to be - at idle and at speed. Gone is the vibratory nature of the engine when crawling around town, and when it’s extended on A-roads, noise levels are significantly lower. It’s no more pleasant sounding than it was before, and performance feels pretty similar – it just sounds much less intrusive, with much less in the way of low-frequency rumble. The feeling of overall refinement is also helped by the lower levels of wind and road noise, which are now as hushed as the best of the opposition, such as the Audi Q3 and Volvo XC40. The P250 is also much quieter than we remember it in any other Land Rover product. It’s impressively quiet at low speeds, and even when extended towards its 6000rpm redline, it rarely feels strained or unrefined. Power delivery is linear, and it suits the character of the Evoque surprisingly well, even if it lacks some of the effortlessness at low revs of the D240 – the only criticisms we’d level at it are that it appears to be far from economical, and it sounds less than exciting. What about ride, handling and performance? Although the old Evoque was viewed as something of a poseur’s car, there was little wrong with the way it drove. But towards the end, it was feeling a little ragged around the edges, and in HSE Dynamic form especially, it wasn’t exactly blessed with decent ride quality. 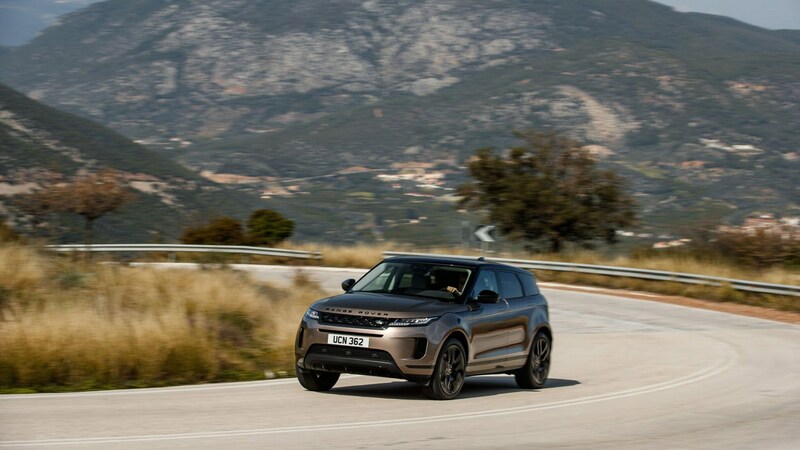 The new Evoque manages to maintain the old car’s near-hot hatch levels of agility, B-road poise and ability to fight off understeer when driven progressively, but combines that quality with a decent dose of ride comfort. Although the ride is softer than before, it’s still reasonably firm. It’s also very well damped (our car’s fitted with optional adaptive dampers, remember) – and there’s an impressive level of isolation (without a corresponding lack of steering feel) on all but the roughest roads. Undoubtedly, the engineers at Gaydon have managed to set up the Evoque beautifully. We tried it in Auto and Dynamic modes on road, and the differences between the two weren’t vast – it’s more about gearbox and throttle mapping than their suspension settings. 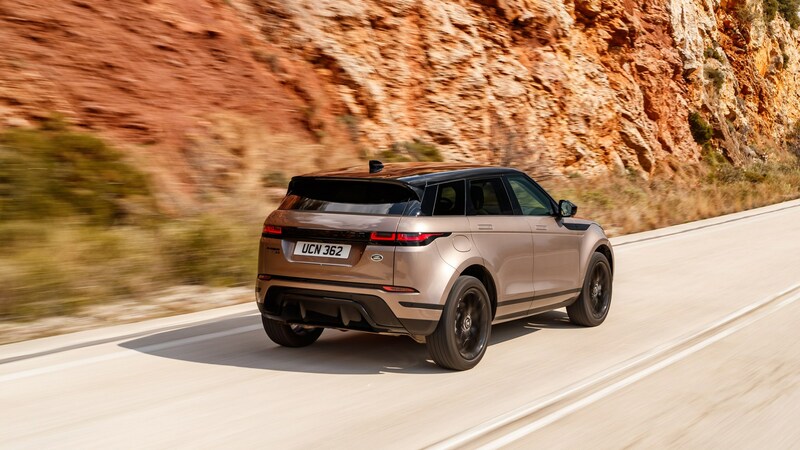 So, although most Evoques are destined for a life in the city or plying the outside lane of the motorway, it’s good to know that if you’re keen on setting good point-to-point times in your lifestyle SUV, it’s more than up to the challenge. In terms of performance, the P250 leads the way, with a 0-60mph time of 7.0 seconds, and a maximum speed of 143mph. In reality, it doesn’t feel that fast thanks to its unruffled nature and a laziness to pick up from low revs and wide throttle openings from its nine-speed automatic transmission. Its 35.8mpg official combined fuel consumption figure (WLTP) might also be difficult to match in typical conditions considering we drained three quarters of a tank in less than 150 miles of enthusiastic driving. The D240 feels less laggy, with way more mid-range torque than the petrol (as you’d expect), but there’s still a little laziness when you need to pull away from low speeds, or rapidly overtake. Higgins says: ‘There’s a little electric boost, to help torque-fill when you’re expecting to have to wait for the turbodiesel to spool up, and to help acceleration at low speeds.’ We’d like a little more to make it feel more usable more of the time. What's the new Evoque like off road? The Evoque needs to be the most effective off-roader for the money, as it wears a green oval on the bootlid. No Land Rover can get away with ‘just enough’ mud-plugging ability. Most owners are unlikely to fully explore what it will do off piste, but it makes for good bragging rights to know that it will cut the mustard should the Beast From The East make a reappearance. The Evoque is available with Land Rover’s brilliant Terrain Response 2 system. It’s activated by the twin glossy touchscreens of Touch Pro Duo (borrowed from the Velar and standard on higher-spec new Evoques) looks gorgeous and works with such clear-headed logic that it is, thankfully, idiot-proof. Tap the icon that best represents the environment you’re moving through or just go for Auto mode and let the car decide. As well as Mud and Ruts, you can select Hill Descent Control at the crest of a particularly steep hill, peg the target speed to its slowest setting and simply let the car do its stuff. For those who need a good view of the road ahead, ClearSight Ground View system is activated from the menu on the centre screen, and allows you to see immediately ahead – between the front wheels – for just these sorts of occasions. 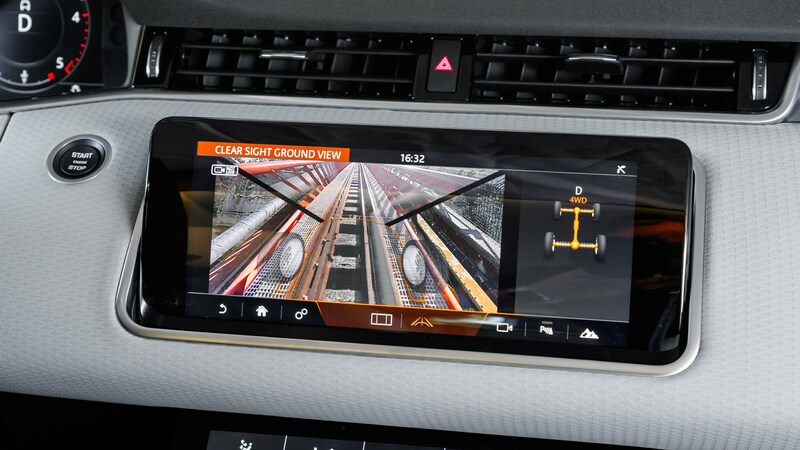 Using a combined feed from cameras in the grille and beneath the mirrors, Ground View brings up a digital field of vision on the infotainment screen some 15 metres across and 8.5 metres deep, your front wheels ghosted in to help you place the car. It’s a system that Land Rover first teased as Transparent Bonnet on 2014’s Discovery Vision concept, and it works very well indeed. We tested it on a challenging off-road course, and sending it up and down such hills was a breeze in the Evoque. We had absolutely nothing untoward happen, and even when it feels out of control, the Evoque’s systems kick in, arresting your speed – feet off the pedals – and making forward progress as easy as picking one's course and nudging the wheel one way or the other. It was the same on dirt tracks – the Evoque just takes them in its tracks, never feeling less than poised or in control. A very impressive effort. What's the Range Rover Evoque like inside? 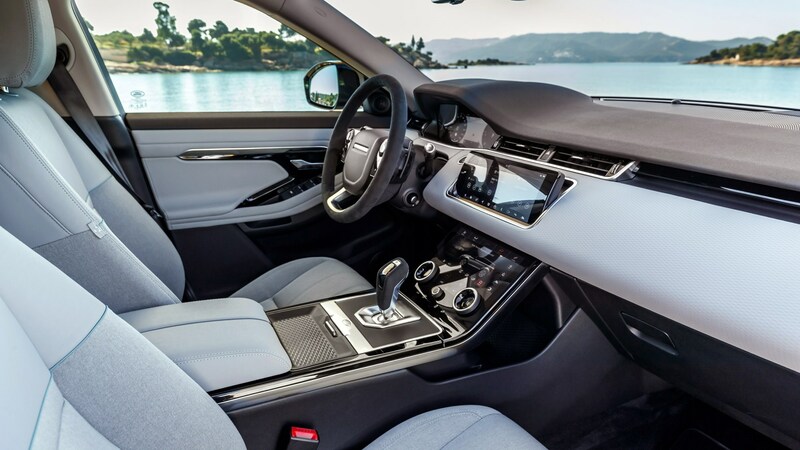 It might look familiar here, but there’s been a huge uplift in the cabin’s quality with yet more Velar-inspired touches, such as the pair of 10-inch touchscreens, and some exquisitely-chosen interior trim and materials. It’s clean and uncluttered, but with so few knobs and buttons, prodding different parts of the screen to control things will take some getting used to when driving. All that’s missing is Audi-style haptic feedback on the Touch Pro Duo screen. It feels sumptuous inside the Evoque with a choice of leather trim, faux suede, a woollen option and a new eucalyptus-derived textile. For such a high-tech cabin, Land Rover’s chosen to debut a couple of new showcase features in the new Range Rover Evoque. Called ClearSight, at the touch of a button the rear-view mirror converts into a display screen for a camera mounted at the rear – perfect if your rear seat passengers or stuff in the boot is cluttering up your view, and essential given the pillbox-like rear windows. The driving position, not to mention much of the cabin architecture, feels familiar and has that rare ability to allow the driver to feel special. There’s an impressive combination of sporty driving position and commanding view. Overall, it’s a satisfying interior in which to spend time, and it feels expensive. Is the new Evoque as cramped as the old one? Definitely not. Its wheelbase has been increased by 20mm with more rear legroom, while the front seats are positioned differently so that your feet have somewhere to stretch out underneath. It also feels wider in the rear, and although it’s far from roomy, you won’t get anywhere near as many complaints from the rear as you did before. There’s also more space in the cabin to store bits and pieces (a genuine problem with the old car), while the boot’s also around 10% larger. With all five seats in place there’s 591 litres of boot space, extending to 1383 litres when the rear bench is folded – that’s larger than an Audi Q5 with the seats up, but smaller with them folded. How much and when does it go on sale? Trim levels are Land Rover’s familiar S, SE and HSE arrangement with sportier R-Dynamic versions of each, plus a special First Edition to celebrate the launch. Prices start at £31,600 for a manual D150 S version. Orders can be placed now, but there’re no deliveries until later in 2019. The shockwaves of the Evoque’s 2011 arrival are still being felt. First-generation Evoque sales were in excess of 100,000 units per year from the get-go, peaked in 2014 at 125,000 and are homing in on 800,000 in total as the car’s phased out. The arrival of the 48-volt mild-hybrid system puts the Evoque on a technical level with its opposition, while 2020's PHEV will add further appeal for those moving away from diesel. For those who aren't, the retention of a 150hp entry-level model means that those who want to stick with diesel still well served. It's early days for Land Rover's vitally-important new baby, but on the evidence of this first drive on- and off-road, they’ve certainly made a dynamic and quality step change needed to continue the old car’s amazing success story. DS 7 Crossback PureTech 225 review: vive la différence!